Submitted by Jeff Buster on Mon, 03/23/2009 - 17:47. 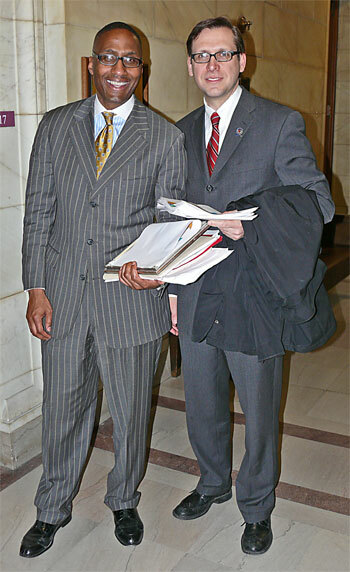 Here are two Cleveland City Councilors who are able to think independently from the political pack. Both Mr. Reed (on left) and Mr. Cummins (on right) were not hesitant this evening to challenge the Council "leadership". But the gerrymandering was a done deal. The news media - TV - loves these guys, because they have something to say and can speak to the cameras. That's a bit unique for the complacent (and complicit) other 19 City Councilors. Zack organized a bus load of his constituents to come to Council from Mt. Pleasant - including his mom. I tried to get a photo of them together but Mr. Reed's mom had left the Council chambers before we could reach her. Brian commented that one good thing that was developing from Mr. Sweeney's gerrymandering was that West was meeting East - the East and West sides of Cleveland that is. Councilor Cummins is from the West side of Cleveland, and Councilor Reed is from the East side of Cleveland. I believe Brian had some meetings with East side Ward leaders to discuss the gerrymandering. This could be the seed that sprouts into real change in Cleveland. What if the vitality and pursuation of Mr. Reed and Mr. Cummins could form a new coalition in Cleveland - with the citizen constituents actually invovled. Wouldn't that be a surprise to Mr. Sweeney? Please post time of tonight's meeting. I looked on Council web site and couldn't find anything. Submitted by Jeffrey Sugalski on Mon, 03/23/2009 - 18:09. Council's website says that the redistricting vote will take place tonight: http://www.clevelandcitycouncil.org/Home/News/March232009/tabid/648/Defa... . Can anyone open the link and download the final map? I cannot, and I'm beginning to think that there is a reason for that. But of course, it notifies the public less than two hours before. Submitted by Jeff Buster on Mon, 03/23/2009 - 18:16. Submitted by Jeffrey Sugalski on Mon, 03/23/2009 - 20:12. The plan that has Old Brooklyn in three pieces and Brooklyn Centre in two passed 16-4. Submitted by noner on Mon, 03/23/2009 - 20:49. I really like the way they listened to their constituents and considered their input. Submitted by lmcshane on Tue, 03/24/2009 - 04:17. And, somehow, I think, despite the dastardly deeds of a crooked council president and his cronies, these guys will prevail. Matt Zone was absent? Nice of Cimperman and Brancatelli to vote against FOR SHOW. I am very disappointed in Polensek, I thought he had a higher moral standard. Guess not. Submitted by noner on Tue, 03/24/2009 - 07:44.
remember those hateful little TV ads he ran in his campaign against Kucinich? Goodness Graciousness and Sakes alive! Submitted by jenita on Tue, 03/24/2009 - 09:05. I realize this may be a situation of cognitive dissonance as you already have your minds made up about who is a "good guy" and who is a "bad guy". I don't think anything is quite so simple. There is no way to vote for show. Their vote means they publicly came out against the ward lines as drawn just like Cummings and Reed did. This means that they too are likely dissatisfied with either the process or the end result. Just because people don't type their thoughts on Realneo, it doesn't mean you should put words in their mouths, or reasons behind their deeds just because you feel like it. One of the things I like least about Realneo commentary is rampant closed-minded, speculation. Submitted by Sudhir Kade on Tue, 03/24/2009 - 09:34. Jenita, keep in mind that we are not a group-think-group. We are a collaborative of independent thinkers who push for truth and justice and question questionable actions on the part of civic leaders. It does not mean we all believe Joe Cimperman is a bad guy - I actually like him and was told he was a good person by Santina Protopapa, who started Progressive Arts Alliance a long time back with some of my help at Weatherhead (and much more of Joe's, I'm sure) some time ago. Joe has been a great supporter of local foods and the urban gardens movement for a while now and I respect these things. I ask that you don't assume all of us are closed-minded and all of us dislike Joe. I also realize you work for Joe, and may have a better understanding of his perspectives and policies than we do, being intimately involved in his affairs - I believe Norm mentioned you are his aide? I also know Amanda Dempsey - another good person - thanks to John Hanson - and believe she works for Joe as well. It would be great to have both of your inputs and perspectives here on the site on these issues. The idea is to value everyone's input - at least from my perspective- around these issues so they can be challenged and enriched. Thanks for your input, Jenita - it would be great to meet and discuss at more length some time, should you wish. Submitted by jenita on Tue, 03/24/2009 - 09:46. Thanks for your comments. Actually, I no longer work for Councilman Cimperman. Submitted by noner on Tue, 03/24/2009 - 10:18. I've watched Joe politic since he first ran for city council as "the working man's candidate", and then the first thing he did was push for a hefty council pay raise. I've heard what he says and I've watched what he does. Often they are very dissimilar. I've also watched his ward gentrify in a very non-progressive way. Cimperman will not stand up if it is not popular with the money folk, period. On that he is consistent. He also has a unique way of disingenuity - recent point in fact - the "urban farming" legislation. It appears to be pro-urban farm and "green". But in reality, it has set us back, far, far back. Are you aware that to now own chickens you not only have to pay a $50 license to the health department, you have to draw up renderings of your hen house and submit them to building and housing. I have never heard of anything so absolutely ridiculous in my life. And forget about roosters? tHat's sustainability??? And yes, I know, "we have to compromise, blahbalhbalhblah..." but we don't have to roll over dead. And, unless you are a developer and have money in your pocket - he will roll over dead when you need him the most. If it walks like a duck and it quacks like a duck and it looks like a duck - its a duck! Another point - Cimperman did help pass legislation providing for proper zoning of community gardens - but where is that now? We are now clearly told that if you start a community garden on a land bank lot, be prepared to lose it to a developer in three years. Who would want to dedicate three years to a garden, the average time needed to just get it up and producing, and then walk away? And where is Joe now, when we need the legislation and support the most? Joe ended up fine and dandy in this redistricting. He had every line drawn to his advantage. I agree with Laura, it was a vote for show. No, I've watched him for too many years and have almost always been disappointed in what ends up. And that nasty little ad campaign he did last fall took the cake. So I'm sorry if someone doesn't like my calling it out. I'm not a Kumbaya girl and never have been. On that I am consistent. Cognitive dissonance is "uncomfortable feeling caused by holding two contradictory ideas simultaneously", but for Joe there is no dissonance - its pure concordance. He plays it out both sides of his mouth. Submitted by lmcshane on Tue, 03/24/2009 - 10:58. Jenita, I know that I value your commitment to a better world. I used to believe that Cimperman shared those values. Give me the benefit of a doubt. I have lived in Tremont and in Brooklyn Centre much longer than you have lived in Tremont. Ask Cimperman why he didn't speak out against the proceedings before the vote? And, please report back. You don't know his history as well as I know his history (and Debra knows it, too). Submitted by jenita on Tue, 03/24/2009 - 11:25. Submitted by lmcshane on Tue, 03/24/2009 - 14:29. Mentions that Cimperman would not take on South Hills in the redistricting, despite Brancatelli's request. Why is that?